Daniel 2:21 reminds believers that God changes the times and the seasons. He places governmental leaders in positions of power, and He removes them. New York has entered a new season of governmental authority. Political power resides with those who do not share our values, and it’s reflected in the tragic turn our state is taking. Yet, just as God called Daniel to stand firm in a land that did not share his values, God is calling us to declare truth to a culture often at odds with Christian faith. In this new season, God has a plan for our state. 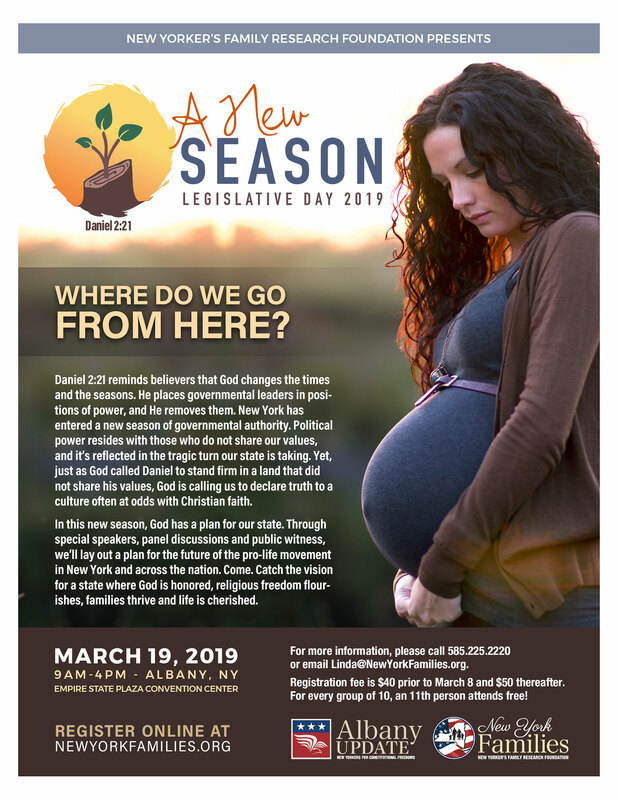 Through special speakers, panel discussions and public witness, we’ll lay out a plan for the future of the pro-life movement in New York and across the nation. Come. 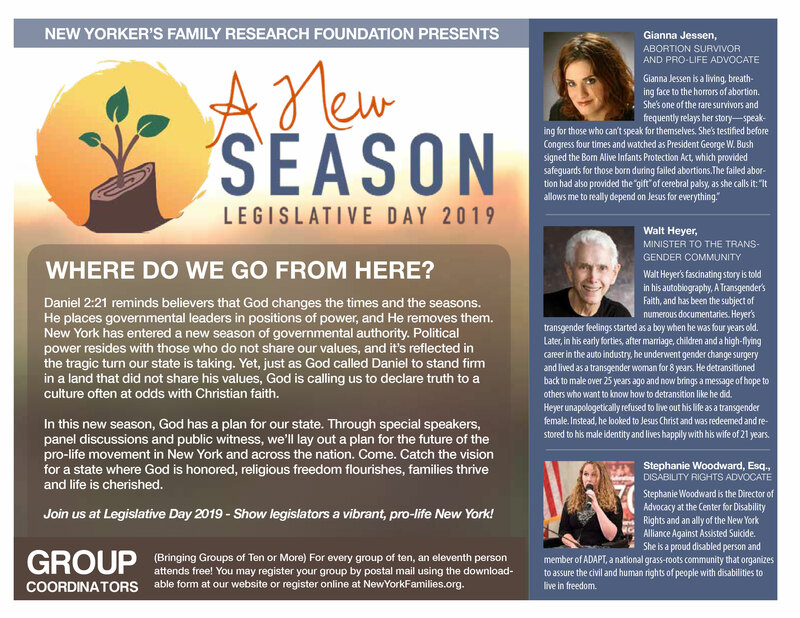 Catch the vision for a state where God is honored, religious freedom flourishes, families thrive and life is cherished. Gianna Jessen is a living, breathing face to the horrors of abortion. She’s one of the rare survivors and frequently relays her story—speaking for those who can’t speak for themselves. She’s testified before Congress four times and watched as President George W. Bush signed the Born Alive Infants Protection Act, which provided safeguards for those born during failed abortions. Walt Heyer’s fascinating story is told in his autobiography, A Transgender's Faith, and has been the subject of numerous documentaries. Heyer’s transgender feelings started as a boy when he was four years old. Later, in his early forties, after marriage, children and a high-flying career in the auto industry, he underwent gender change surgery and lived as a transgender woman for 8 years. He detransitioned back to male over 25 years ago and now brings a message of hope to others who want to know how to detransition like he did. Heyer unapologetically refused to live out his life as a transgender female. Instead, he looked to Jesus Christ and was redeemed and restored to his male identity and lives happily with his wife of 21 years. Stephanie Woodward is the Director of Advocacy at the Center for Disability Rights and an ally of the New York Alliance Against Assisted Suicide. Stephanie attended Syracuse University College of Law where she earned her J.D. with a certificate in Disability Law and Policy and her M.S.Ed. in Disability Studies. Previously, Stephanie worked as a litigator in Miami, Florida focusing on Disability Rights law. Stephanie is a proud disabled person and member of ADAPT, a national grass-roots community that organizes to assure the civil and human rights of people with disabilities to live in freedom. While Stephanie's work spans across all areas of Disability Rights, she is particularly interested in deinstitutionalization, community living, ending violence against people with disabilities, and improving access in the community. She has also testified before the NYS Assembly Health Committee in opposition to legalizing assisted suicide, and has spoken about this issue at conferences, bar association events, and other public forums as well as in media interviews, and her op-ed on the issue was published in the Syracuse Post Standard. Garth Van Meter is Vice President of Government Affairs at SAM, where he serves as chief liaison for the organization to Congress and the Executive Branch, representing SAM at meetings with the Drug Czar (Director of the Office of National Drug Control Policy), Surgeon General, NIH, and Attorney General, and coordinating with other allied organizations in law enforcement, treatment, and drug prevention. Previously, he served as the Deputy Chief of Staff for Louisiana Congressman John Fleming, M.D. (R-LA-4), a former addictions treatment center director and champion of public health-focused marijuana policies. Van Meter also served as the Legislative Director for Congressman Chip Cravaack (R-MN-8) and Deputy Chief of Staff for Congressman Bob Inglis (R-SC-4). He received his MBA and BS in Computer Engineering from The George Washington University. We recommend that Legislative Day attendees purchase breakfast items before entering the Capitol Complex or at one of the Concourse cafeterias before the event. You are welcome to bring food and beverage items into the Convention Center. Coffee, tea and water will be provided in the convention hall throughout the event. A box lunch (sandwich or salad, chips, cookie and bottled water) can be pre-purchased for $15.00. If you do not want to purchase a box lunch you may either find lunch at one of the concourse cafeterias or bring your own from home. New Yorker’s Family Research Foundation will no longer be offering shuttle busing to the Convention Center. NYFRF recommends parking in the garage located beneath the Empire State Plaza in the V-Lot. This parking area is accessible through the I-787 Empire State Plaza exit. 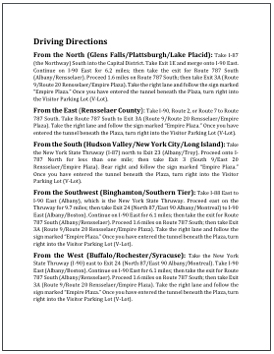 Please note that putting “The Egg” or “Empire State Plaza” into GPS, Google Maps or other mapping systems will not bring you to this parking area. The GPS coordinates for the V-Lot parking area are N 42.650674, W 73.760061. Visitors are required to show photo identification upon entry and all vehicles are subject to search by the State Police. 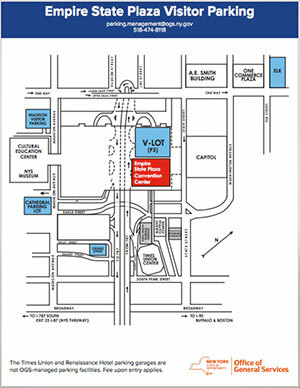 Vehicles can expect to pay $10.00 upon entry to the V-Lot. Though the parking garage does take credit card, having exact cash ready will help move this process along more quickly. Please plan to arrive before 8:00 AM to find adequate parking. Additional parking information is available at https://ogs.ny.gov/ESP/Parking.asp. Please keep in mind that you will be representing Christ before your elected officials. Modest business attire is requested. 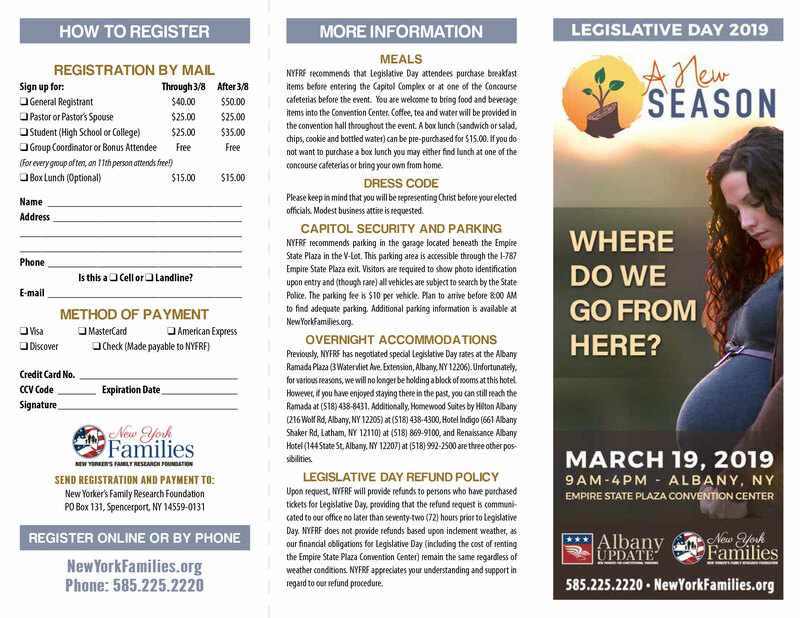 All Legislative Day attendees, regardless of age, will participate in the general sessions. Please be advised that some content may be mature so we strongly advise that Legislative Day attendees be senior high school students or older. 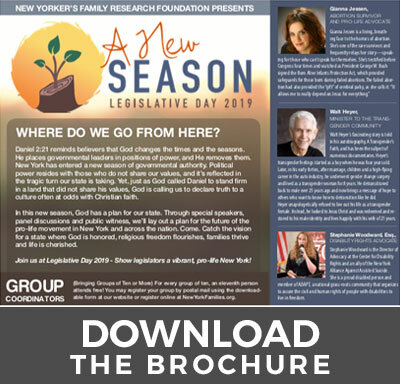 Online: Coordinators can also register groups of up to one hundred members online at NewYorkFamilies.org. 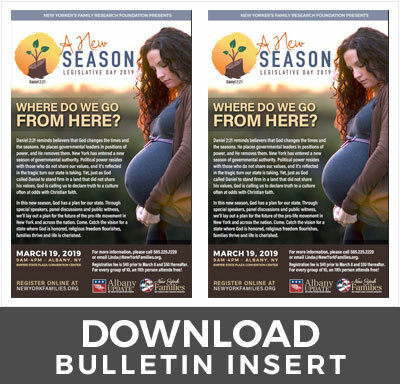 If you register your group online, later additions to the group cannot be made online, but can be made by postal mail or by calling the office at (585) 225-2220. Groups larger than one hundred must be sent by postal mail. When arriving at the Convention Center, go to the registration table for instructions. Tables will be marked with your group name. It would be wise to arrive by 7:30 AM so that your group will be seated by our start time of 9:00 AM. Please return your list of attendees by March 8, 2019. We will take additions to your group after this date, but it is very helpful for planning purposes if we can receive registrations by this date. Please include a name (church, organization or individual) by which you would like your group identified. Your group will be seated together by this name. Make sure all registrants in your group know the group name so they can find their seating. Arrange for transportation as a group (optional). Split transportation costs with those riding, if renting a bus or carpooling. Parking for buses is available but needs prior approval by the City of Albany. If you are planning on a bus, please contact our office and we will guide you through this process. New Yorker’s Family Research Foundation will no longer be offering shuttle busing to the Convention Center. Attendees can expect to pay $10.00 per vehicle per day in the Empire State Plaza parking garage. Collect registrations. 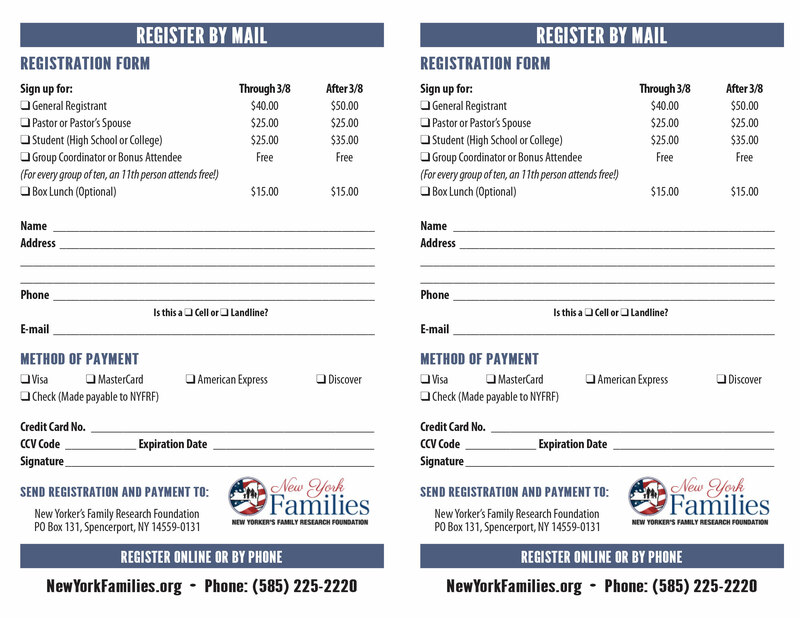 Have registrants make checks payable to NYFRF, but do not include transportation costs in the portion you send to NYFRF. Group coordinators should clearly identify if there are any pastors, pastoral spouses, or students in their group. Questions? 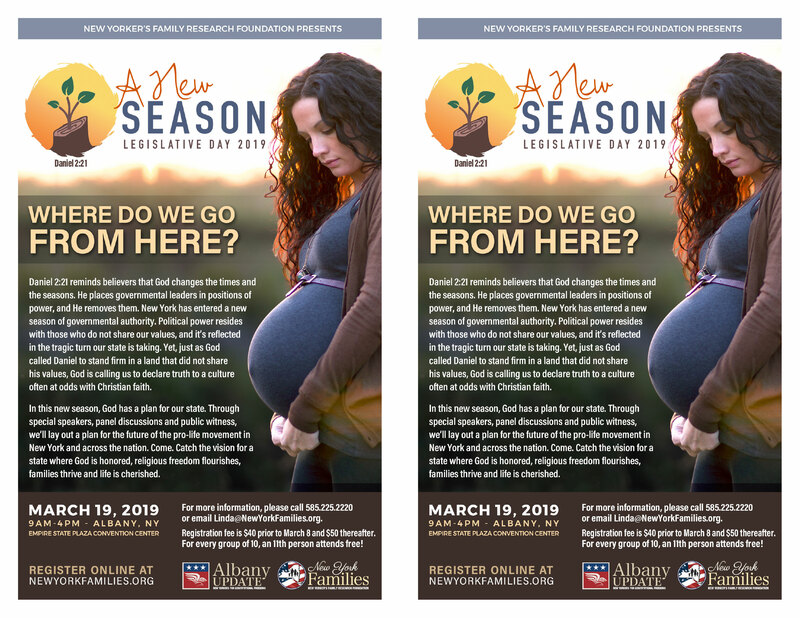 Call or email Linda at (585) 225-2220 or Linda@NewYorkFamilies.org. 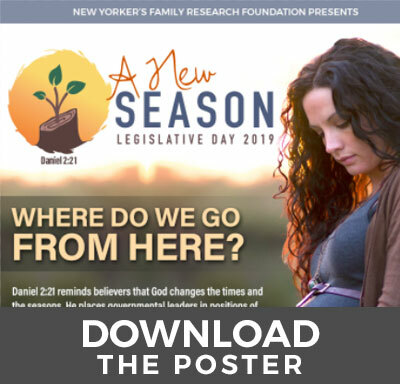 Upon request, New Yorker’s Family Research Foundation (NYFRF) will provide refunds to persons who have purchased tickets for Legislative Day, providing that the refund request is communicated to our office no later than seventy-two (72) hours prior to Legislative Day. NYFRF does not provide refunds based upon inclement weather, as our financial obligations for Legislative Day (including the cost of renting the Empire State Plaza Convention Center) remain the same regardless of weather conditions. NYFRF appreciates your understanding and support in regard to our refund procedure. 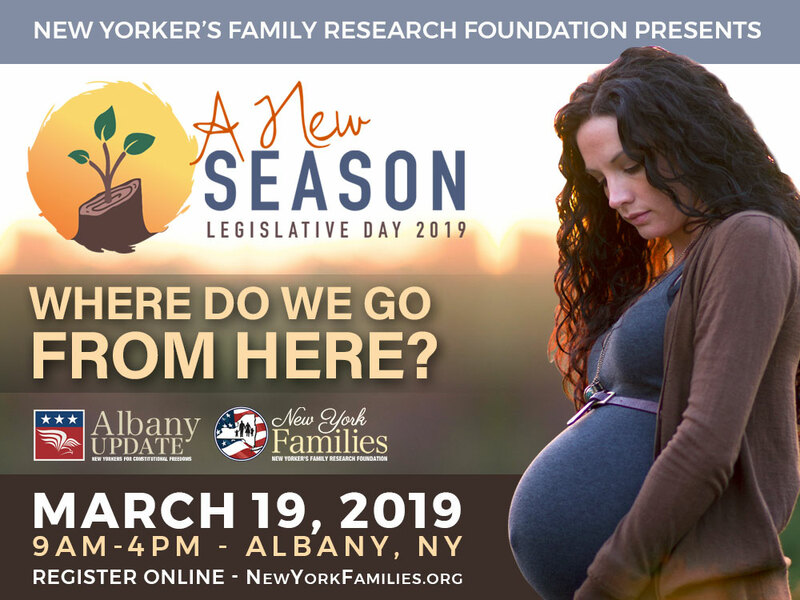 Previously, New Yorker’s Family Research Foundation has negotiated special Legislative Day rates at the Albany Ramada Plaza (3 Watervliet Ave. Extension, Albany, NY 12206). Unfortunately, for various reasons, we will no longer be holding a block of rooms at this hotel. However, if you have enjoyed staying there in the past, you can still reach the Ramada at (518) 438-8431. Additionally, Homewood Suites by Hilton Albany (216 Wolf Rd, Albany, NY 12205) at (518) 438-4300, Hotel Indigo (661 Albany Shaker Rd, Latham, NY 12110) at (518) 869-9100, and Renaissance Albany Hotel (144 State St, Albany, NY 12207) at (518) 992-2500 are three other possibilities.